As someone who grew up in Minnesota, experiencing the holidays in the South is hard for me. I am a total snow and cold person. It’s in my blood, pretty sure. 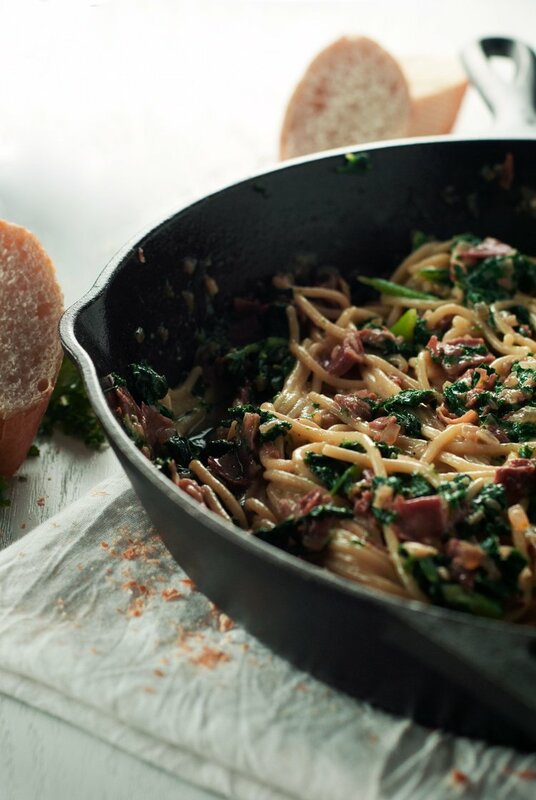 So it’s very important to me to get into the spirit of the holiday season, which is why you can find me serving up my husband’s favorite Spaghetti Carbonara with Kale and Prosciutto. That seems weird, right? How does spaghetti carbonara get me in the holiday spirit? I would say it’s because I am taking the time to make something super special for someone who isn’t me. I love keeping some Glade® candles on hand, because smell is such a huge thing for me, memory-wise. I can remember so many things from my childhood when I catch a scent of something familiar. It’s crazy how that works, yeah? 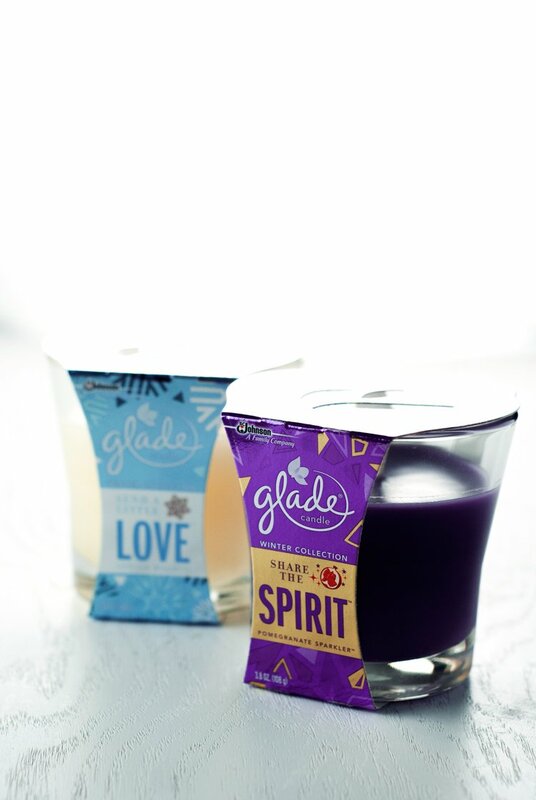 Glade® understands how important smell is, so they made their holiday scents to help embody those emotions of the season. You don’t just smell Glade®, you feel Glade®. So when I am wishing for snow, I’m hanging out with my Be At Peace™ special edition scented candle, enjoying the Balsam Fir and Juniper that remind me of winter at home. But when I’m making my special spaghetti carbonara with kale and prosciutto for my husband, I have my Share The Spirit™ candle close by, reminding me with scent of Pomegranate Sparkler™ that this is the season of sharing, and sharing is amazing. What puts you in the holiday spirit? Is it inviting everyone over for an intimate gathering? Sharing a special dish with family? 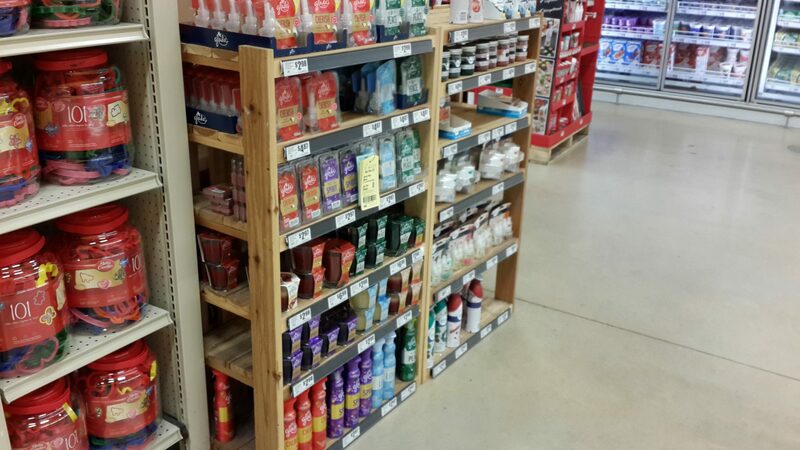 Tell me all about it, and then be sure to head over to HEB and pick up some of Glade®’s Holiday Collection and make some of my amazing (and zomg fast and easy!) 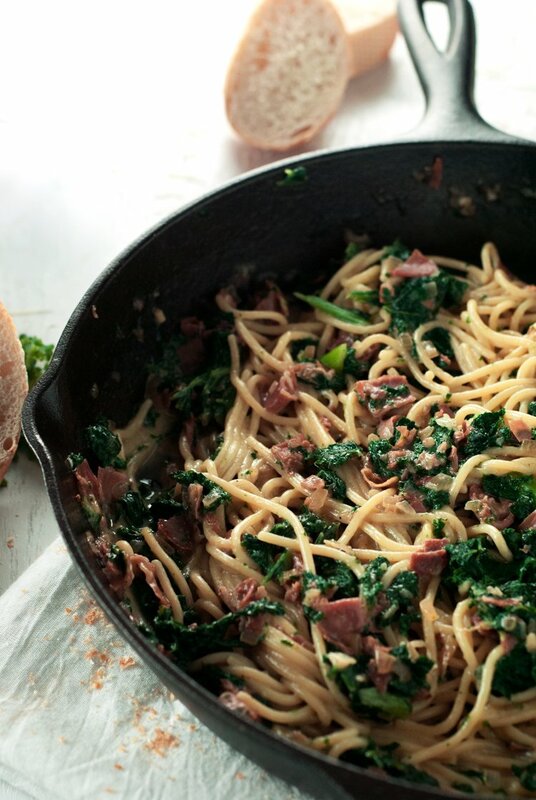 spaghetti carbonara with kale and prosciutto! Click HERE to discover even more recipes! In a large skillet, heat the olive oil over medium high heat. Add the prosciutto and cook until just beginning to brown, around 2 minutes. Add the shallot and continue cooking for an additional 2 minutes. Pour in the white cooking wine and reduce by half, scraping up the brown bits as it cooks. Remove pan from heat. Heat a large pot ¾ full of generously salted water over high heat until boiling. Add the noodles and allow to boil for 5 minutes. 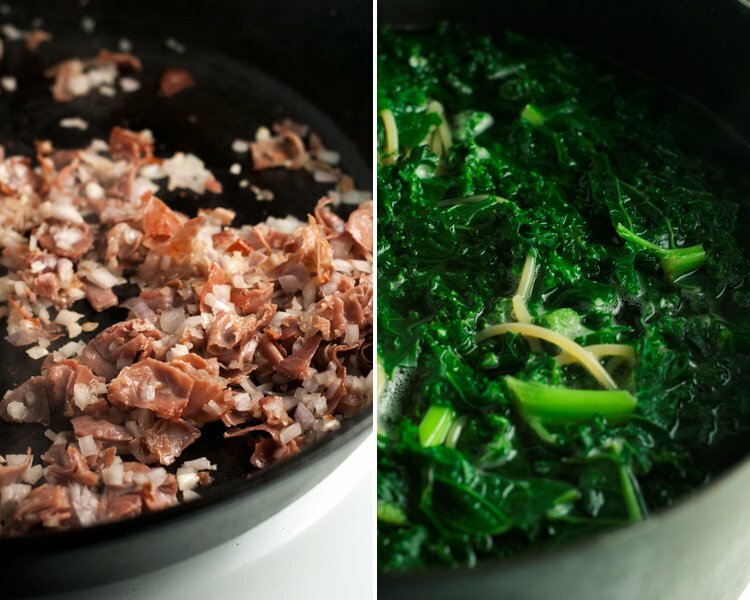 Stir in the kale and continue boiling for another 5 minutes, or until the noodles are al dente. In the meantime, add the eggs to a small bowl and whip gently. Stir in the cheese and generously pepper. 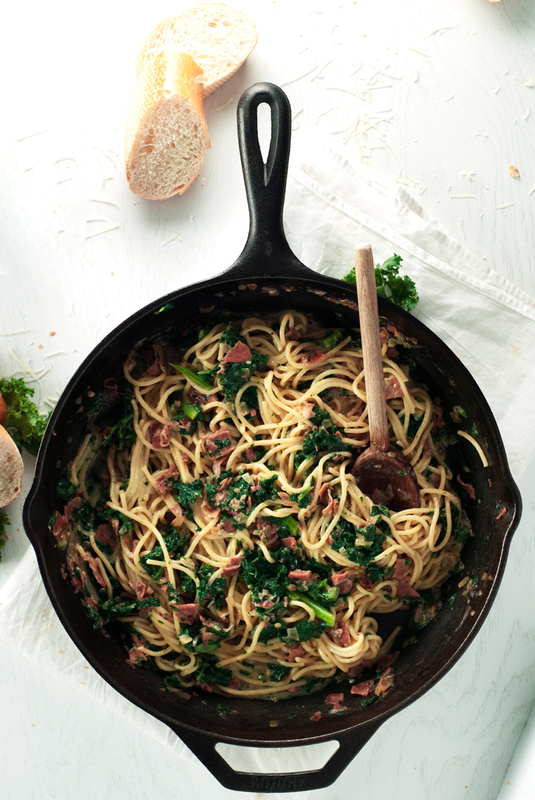 Once the noodles are done, reserve about ½ cup of the cooking liquid, then drain the noodles and kale. Put the skillet back on over medium heat until just warmed, then remove once more. Add the noodles and kale and stir gently. Add about ¼ cup of the reserved cooking liquid to the egg and cheese mixture and stir gently. Pour over the noodles and gently toss until everything is covered in a creamy coating. If it is too runny, turn the heat back on briefly until it thickens. If it is too thick, add a little extra cooking liquid. Divide between 4 bowls and serve immediately with crusty bread. 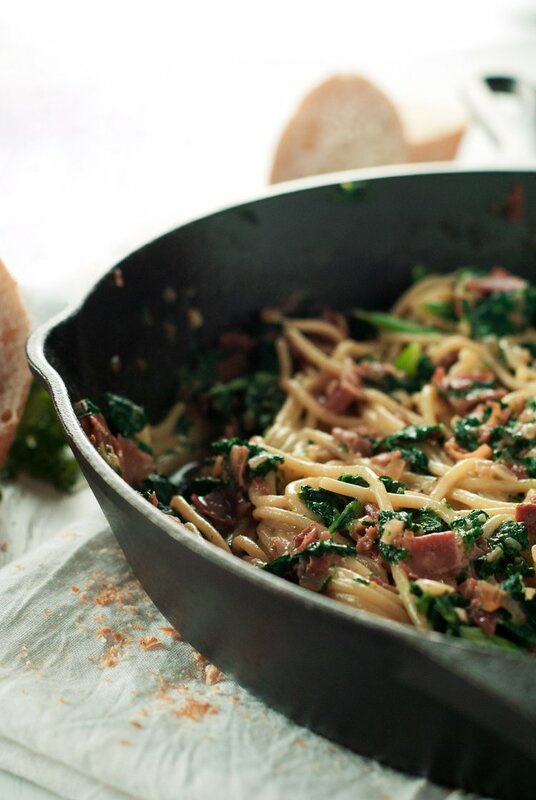 I love the addition of kale to a classic carbonara! My kids might even eat something green this way! I know I will. Out of curiosity, what is, and how does one, "wrangle cats" (as posted in your bio)?? ?